Once upon a time, Upper Grinnell Lake didn't even exist. Instead, the Grinnell Glacier covered the entire area where the lake now is, along with covering the area where I'm standing as well as all those weird rock formations are on the right. However, the warming climate has taken a heavy toll on the glaciers in the park, and the Grinnell Glacier is no exception. 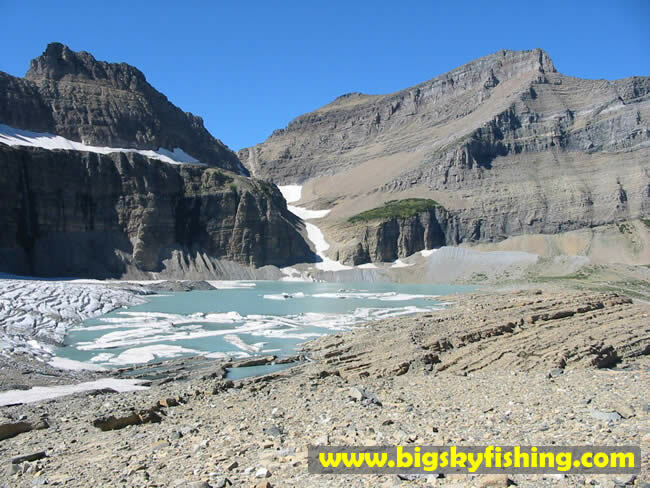 Only 40% of the Grinnell Glacier remains. Taking its place, by filling in the depression left by the retreating glacier, is Upper Grinnell Lake. The rather odd "ridged" rock formations you see in this photo were created by the movement of the glacier and which, due to the glaciers melting, is now exposed.